Fundraiser by Sandra Kaye Martin : Help Youssef Begin Again. Youssef has been creating baklava since he was 16, apprenticing under one of the most famous “sweet shops” in his city. 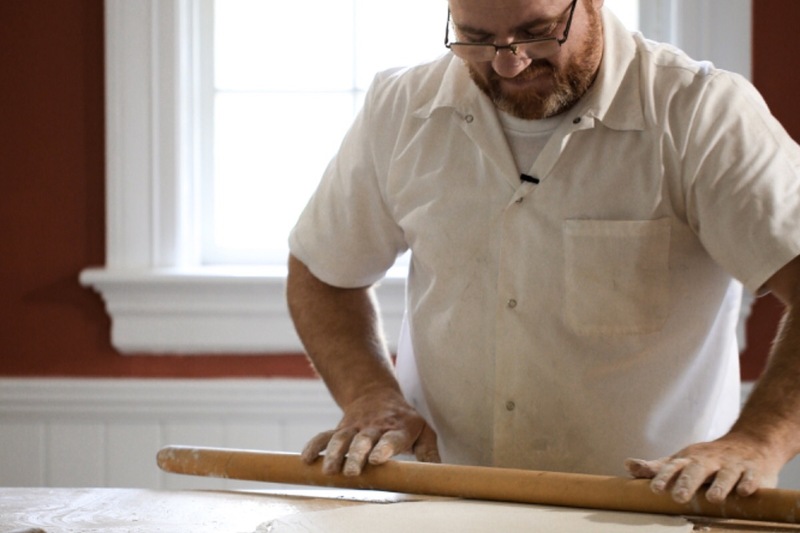 By 24 years old he owned his first bakery with his brother and father. Then war came to his country. Youssef Akhtarini, his wife and 5 children fled from their home in Aleppo, Syria to safety in Turkey. To reach the border, they rode in the back of a small pick up truck, traversing death and destruction, while military planes flew overhead and shelling could be heard all around them. A trip that would have taken 30 minutes before the war, took over 10 hours. After arriving, they registered as refugees, and were accepted to resettle in the United States — In Providence, Rhode Island; a process that took 2 years; and saw the birth of their youngest daughter, born in Turkey. Youssef’s dream is to open another bakery in his new home. Like all of those who love to cook, one of his greatest joys is to create food that people love. 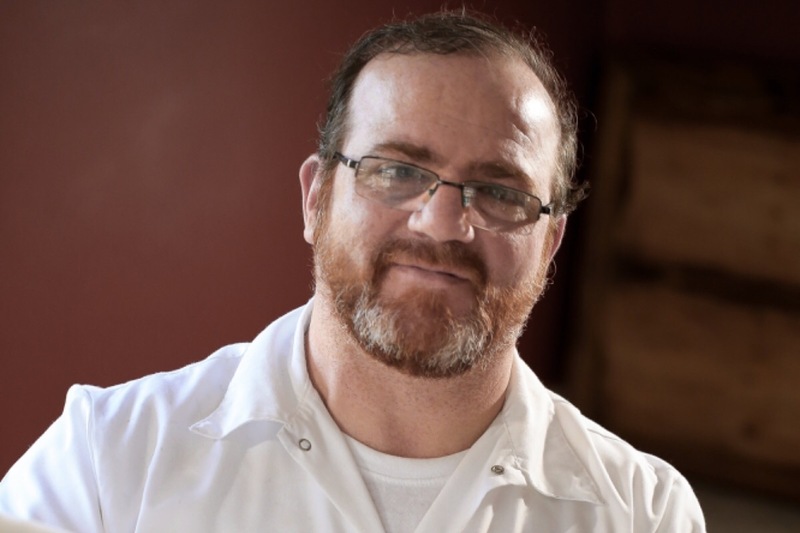 Youssef’s baklava bakery, serving a wide variety of baklava and authentic Syrian treats will be opening this fall, and he needs your help. 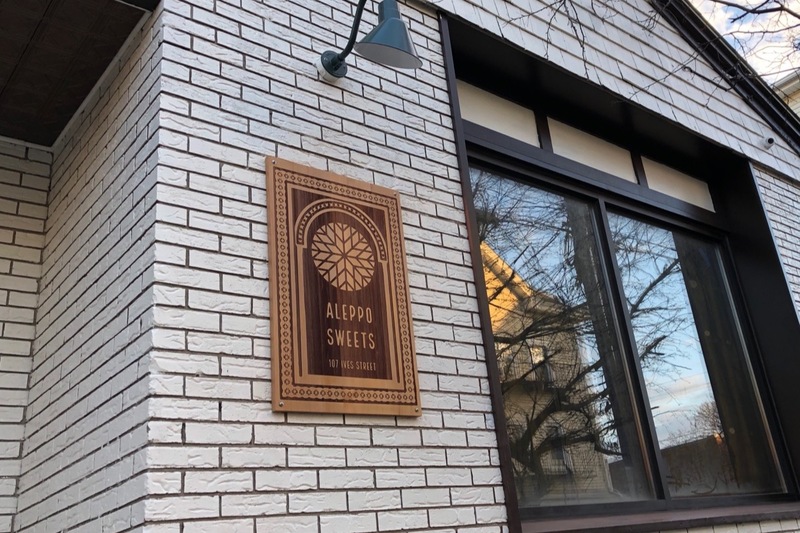 Your donation will be used to establish his bakery, from installing a professional kitchen and an inviting space for customers; to point-of-sale software, baklava boxes, signage, website design and initial operating expenses. Youssef needs your support to help him through the bumpy stages of starting a new business. This is a beautiful opportunity to spread love and kindness as a community of people welcoming and helping a family to begin again. Please DONATE ... help Youssef start over and support his family of 8, doing what he loves. Please, SHARE LOVE — and forward this page to your friends and family! And come to Ives Street in Providence this fall for the best baklava you’ve ever eaten! My name is Sandy Martin. I am a U.S. Citizen, born and raised in the U.S.A. I met Youssef and his family while volunteering at the refugee resettlement agency in Providence, RI, Dorcas International Instititue of RI (where I continue to volunteer). 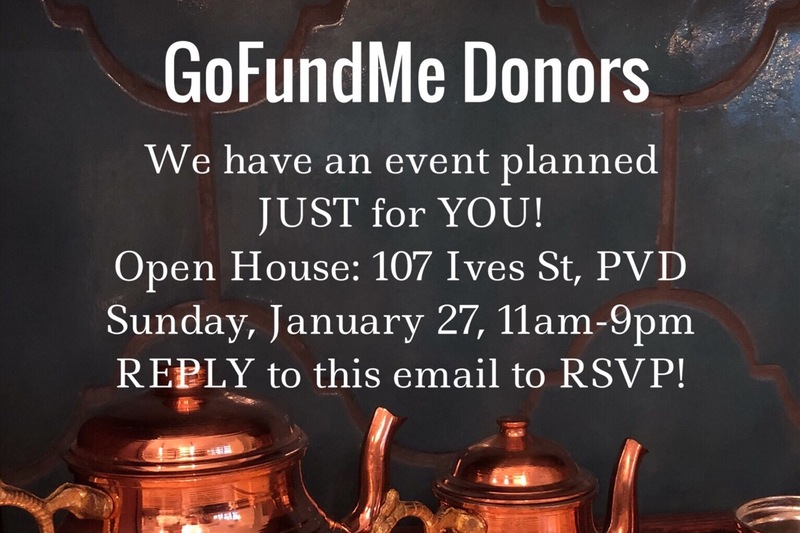 My husband and I, along with YOU, are helping Youssef to realize his dream of opening a bakery in his new hometown of Providence, Rhode Island so he can support his family doing what he loves. 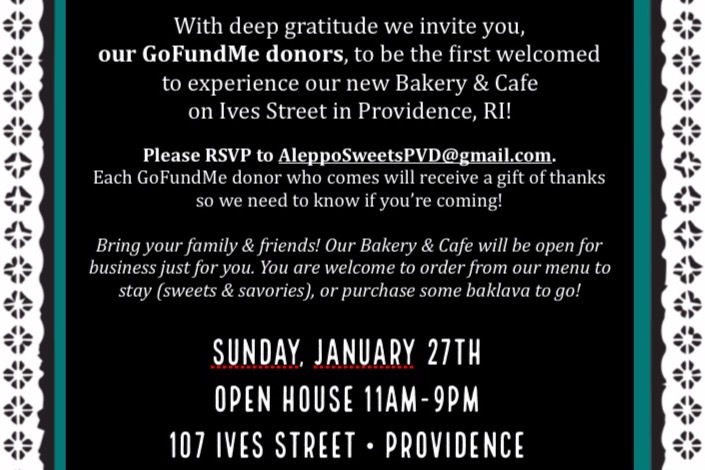 Funds raised for this campaign will be deposited directly into the Aleppo Sweets business account for Youssef’s future bakery on Ives Street in Providence, Rhode Island opening, God willing, Fall 2018. *GoFundMe wanted a thorough description of who I was, where I’m from and how I know Youssef, since he is from Syria. **Deep gratitude to Jillian and Travis at Minus Red for donating their time and equipment to create the BEAUTIFUL video for Youssef and his family. Our THANKS to each of you who came out for our OPEN HOUSE on Sunday! 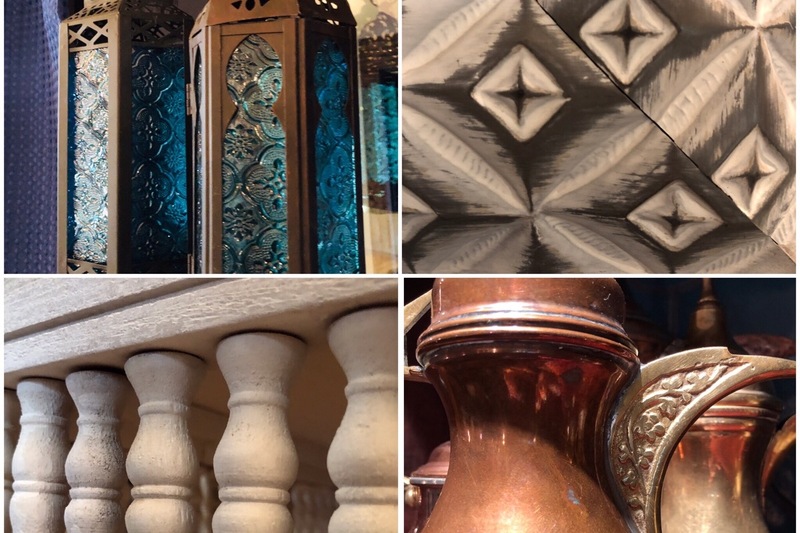 Our “SOFT OPENING” continues this week on Wednesday — come on over and settle in with a warm pot of tea (or Turkish coffee), a mezze platter and some freshly baked BAKLAVA (of course)! It’s cozy, and so far the reviews on the food have been fantastic! Spread the Word! Pass it on! We can’t wait to welcome you!!! Come take a peak at our new place at 107 Ives Street, in Providence THIS SUNDAY between 11am - 9pm! 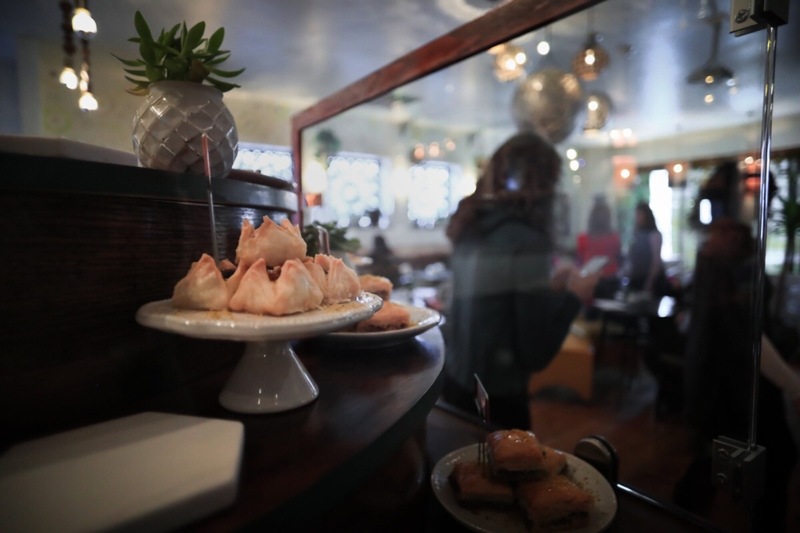 Bring a friend, order some tea and a mezze platter and top it off with some baklava (of course!). 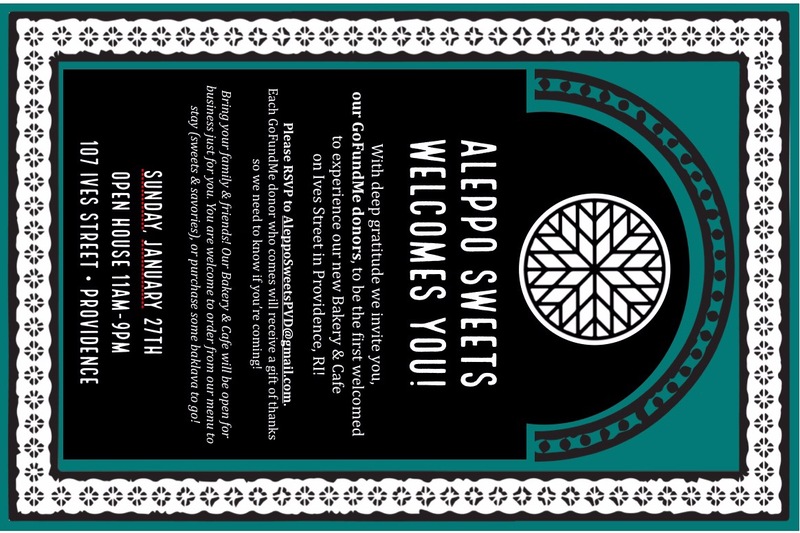 If you would like to RSVP by replying to this email, or by sending your RSVP to alepposweetspvd@gmail.com WE WILL PREPARE A SPECIAL GIFT for YOU and put your name on it. Sadly, without an RSVP by Friday we won’t have enough time to prepare it — but you and your friends are still most welcome! Sunday will begin our “soft opening” that will give us an opportunity to start a little more slowly, work out our processes, and learn from YOU our customer. At this moment about 90% of our staff is from the Syrian Refugee community, having fled the civil war that is still ongoing, with more than half of the population of the country displaced. As we all welcome YOU, I know you too will welcome THEM. It’s been a blessing to be part of training this week, not only to see each of them coming for employment, but also as we discuss how to convey the unique welcoming, kind, generous qualities of the Syrian culture in a simple cafe. We hope you enjoy it, and know how grateful we are to each of you. We have an event planned just for you! Please RSVP by hitting “REPLY” or by writing to AleppoSweetsPVD@gmail.com. Each GoFundMe donor who comes will receive a gift of THANKS so we need to know if you're coming! Bring your family & friends! Our Bakery & Cafe will be open for business JUST FOR YOU. You are welcome to order from our menu to stay (sweets & savories), or purchase some baklava to go! With Peace, Love .... and Baklava!